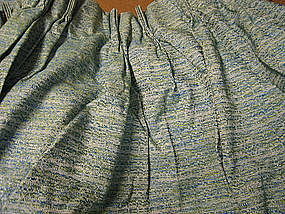 Vintage unused king size fitted sheet in "No Iron Muslin" blend (65% Polyester 35% cotton). 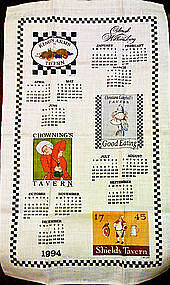 The listed photo is only showing portion of the sheet, but there are hippos, elephants, gazelles and other animals featured. Additional photos are available. The flat king size is also available. I need your zip code to calculate the postage. 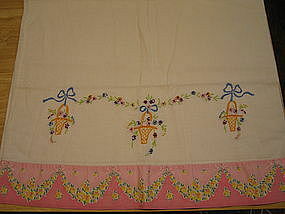 One vintage panel measuring 44 inches in width and 80 inches in length, with 3 inch hem. It is in a pleated design. There are no holes, rips or threadbare areas. 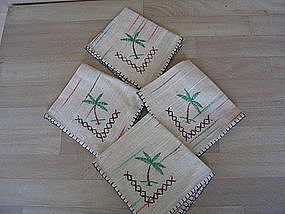 They are in a clean condition. 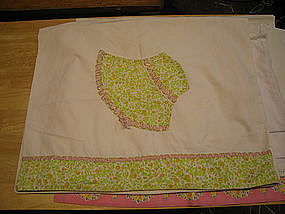 2 panels in this size are available and priced individually. I need your zip code to calculate the postage. 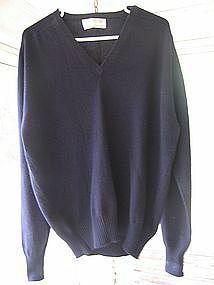 Vintage navy blue sweater of 100% cashmere marked as McGeorge of Dumfries made in Scotland. 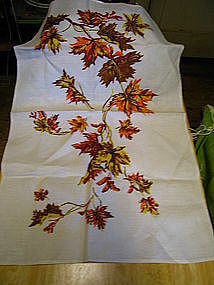 It is size marked 112cm/44 inch. There is no damage. Complete photos by email. The color is a deep navy blue, but due to the fact that I photograph everything in natural sunlight, it is not showing accurately. Will attempt better photos soon. I need your zip code to calculate the postage. This leather belt isn't old enough to be considered vintage, but is not new. 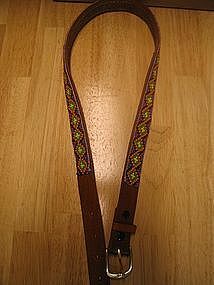 It measures 36 1/2 in length (measurement includes the buckle) and slightly under 1 inch in width. 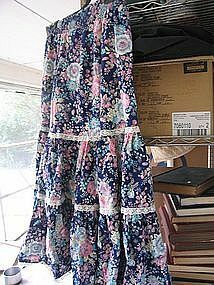 It has no damage, but my daughter did wear it a few times several years ago. Complete photos by email. I need your zip code to calculate the postage. 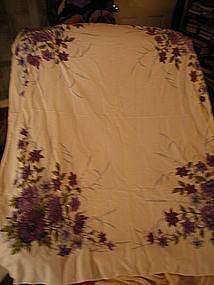 Vintage soft cotton oblong tablecloth with purple dahlias and lilies. It is an odd shape of 54 x 44 inches. There are no rips, tears or repairs. 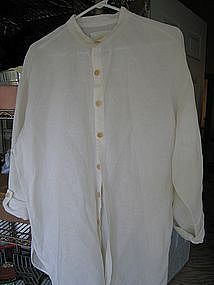 There is a faint yellowing to one corner (it may come out - it has been packed away for many years, and I've not washed it, since unpacking). I need your zip code to calculate the postage. 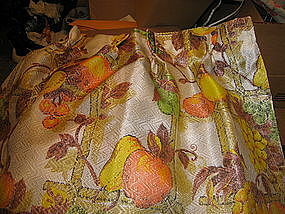 Included in this vintage cafe style kitchen curtain set is one valance with 2 cafe curtain pieces. I believe they are made of fiberglass. The curtains have the older style yellow plastic rings. 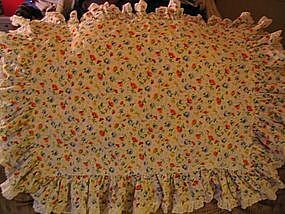 The valance measures 52 x 9 1/2 inches and 1 (one) curtain piece measures 21 x 22 inches. There is some fraying on the edges, and I will provide photos of areas. There are 6 sets available and priced individually. I need your zip code to calculate the postage. 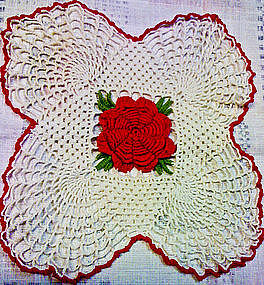 Vintage crocheted doily in a butterfly shape a raised red rose. It is almost 14 x 14 inches. There is no damage. 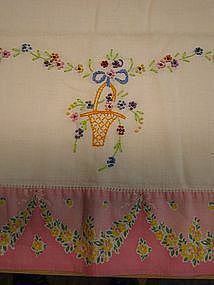 The doily is showing an ivory shade on the backdrop, but there no stains. I have 3 of these and are priced individually. I need your zip code to calculate the postage. 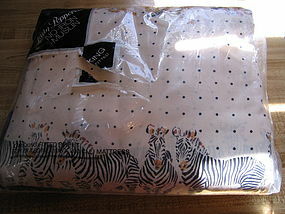 Queen size fitted sheet of 50% cotton 50% polyester permanent press percale. No rips, tears, repairs or stains. 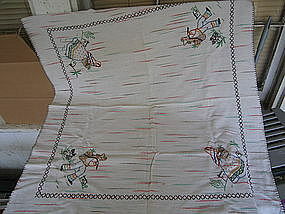 Please email for additional photos, as the listing is showing the matching shams. I need your zip code to calculate the postage.